Mad Money Features a delightful cast that include Diane Keaton, Ted Danson, Queen Latifah, Katie Holmes and Roger Cross in this comedy about a group of women who after playing by the rules, devise a plan to steal soon-to-be destroyed currency from the Federal reserve. The story begins with Bridget (Keaton) and Don (Danson) that has their middle class lifestyle being destroyed due to the debt that Don has amounted, unbeknown to Bridget. In a bid to save their home, she takes a job as a janitor at the Federal Reserve Bank in Kansas City. In her regular duties, she devises a plan to "rescue" money otherwise slated for destruction, along with her accomplices, they stockpile cash over a three year period. 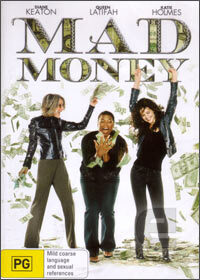 Although the movie is quite clichéd and over the top at times, thanks to Latifah, it does have a few entertaining moments but at the end of the day, Mad Money seems a little stale and may have been a better movie in the 90's as compared to the 21st century. Definitely one for the fans only!